Arizona is a visionary of water planning and management. From water supply projects, to innovative programs including drought preparedness, underground water storage, 100-year water supply requirements, mandatory conservation programs and use of reclaimed water, we lead the nation in comprehensive water supply management. However, we are not without challenges. For over a century, Arizonans have made difficult choices which have resulted in the ability to meet water demands during this ongoing drought without the need for water rationing. The Colorado River system, which supplies 36 percent of Arizona’s total water use, has experienced extensive drought conditions for the past 19 years. This has resulted in Lake Mead dropping to historically low reservoir levels. Most recent projections show a probability of shortage as soon as 2020, although expected shortage volumes are relatively small compared to Arizona’s total Colorado River allocation. While this is cause for concern, these conditions are not unexpected. Arizona has been proactively building resilience and implementing innovative water management strategies to secure dependable water supplies. How do you avoid a water crisis... you plan ahead! On January 2019, Arizona Governor Doug Ducey announced the Governor's Water Augmentation, Innovation and Conservation Council to help ensure the certainty and vitality of Arizona’s water supply long into the future. 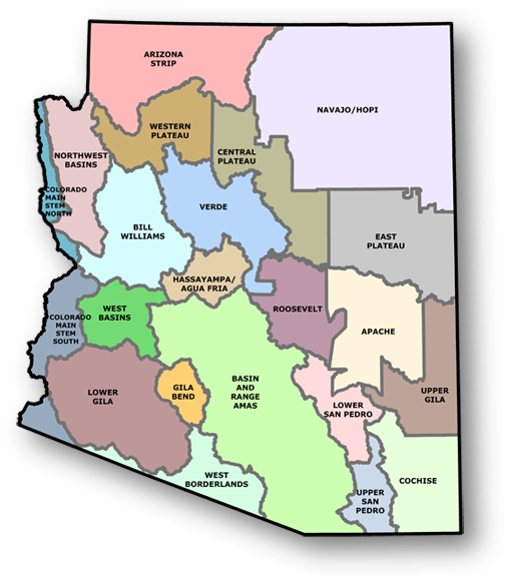 The Arizona Department of Water Resources will work closely with the 22 Planning Areas to identify issues that are resulting in water demand and supply imbalances and to develop strategies will be successful in addressing them. Drought is a prolonged period of below-average precipitation severe enough to negatively impact the environment and human activities. While few areas can receive as high as 22 inches of precipitation other areas can receive less than 4 inches. Arizona has recognized the need for drought planning and preparedness and has taken action to reduce drought’s impact on the state. In urban areas, Arizona has already made significant investments in importing and storing water supplies, providing an important buffer against impacts of the current drought. The U.S. Drought Monitor is the official record of drought for Federal drought relief claims. 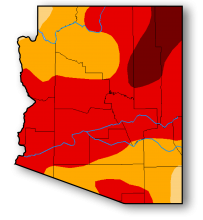 The Arizona Drought Monitoring Technical Committee confers weekly to advise the U.S. Drought Monitor authors on the current drought conditions in Arizona, and makes recommendations about the position of the drought boundaries for Arizona.